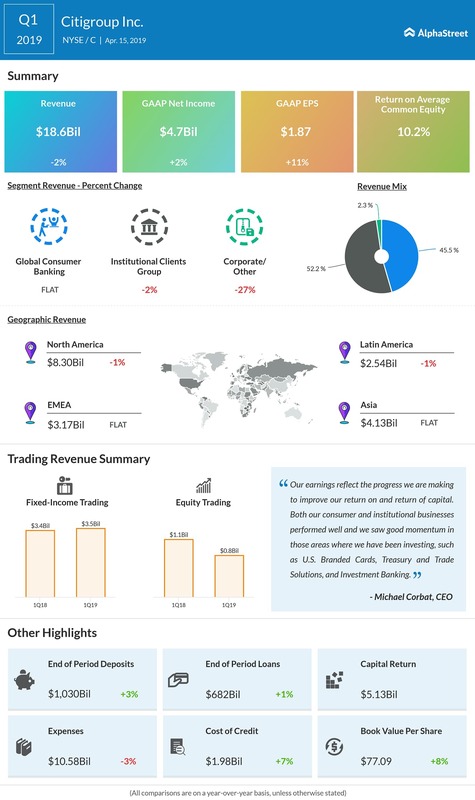 Citigroup (NYSE: C) reported a 2% rise in earnings for the first quarter of 2019 helped by a reduction in expenses and lower effective tax rate, partially offset by the lower revenues and higher cost of credit. The bottom line exceeded analysts’ expectations while the top line missed consensus estimates. Net income increased 2% to $4.71 billion and earnings climbed 11% to $1.87 per share. The EPS growth was primarily driven by a 9% reduction in average diluted shares outstanding as well as the growth in net income. The company said its earnings reflect the progress it is making to improve its return on and return of capital. Meanwhile, revenues decreased 2% year-over-year to $18.58 billion from the previous year quarter, which included the impact of a $150 million gain on the sale of the Hilton portfolio in North America Global Consumer Banking. Excluding the gain, revenues inched down 1% due to lower revenues in Equity Markets as well as mark-to-market losses on loan hedges, both in the Institutional Clients Group, and the continued wind-down of legacy assets in Corporate/Other. For the first quarter, revenue from Global Consumer Banking of $8.5 billion remained largely unchanged on a reported basis. In constant currency, revenues rose 4%, excluding the gain on the sale of the Hilton portfolio in the prior-year period, driven by growth in all three regions. Institutional Clients Group revenues declined by 2% due to weakness in foreign exchange, lower market volumes and client financing balances in the Markets and Securities Services segment, which showed a 6% decline in revenues. Corporate/Other revenues fell by 27% due to the wind-down of legacy assets. Operating expenses declined by 3% year-over-year as investments were more than offset by efficiency savings and the wind-down of legacy assets. However, credit costs rose by 7% reflecting volume growth and seasoning. Allowance for loan losses was $12.3 billion at quarter-end, or 1.82% of total loans, compared to $12.4 billion, or 1.85% of total loans, at the end of the prior-year period. Total non-accrual assets declined 13% due to a drop in consumer and corporate non-accrual loans. Citigroup’s end-of-period loans rose 1% to $682 billion from last year. Excluding the impact of foreign exchange translation, end-of-period loans increased 3% as 5% aggregate growth in Institutional Clients Group and Global Consumer Banking was partially offset by the continued wind-down of legacy assets in Corporate/Other. The company’s end-of-period deposits were $1 trillion as of quarter end, an increase of 3% from the prior-year period. In constant-dollars, Citigroup’s end-of-period deposits grew 5%, driven by 8% growth in Institutional Clients Group as well as 2% growth in Global Consumer Banking. Shares of Citigroup ended Friday’s regular session up 2.29% at $67.42 on the NYSE. Following the earnings release, the stock inched up 0.64% in the premarket session.